Salmon. Tuna. Meatloaf. That’s the short list of foods I just will not eat. There’s more…mayonnaise, hard boiled eggs, anything made with the combination of mayonnaise and hard-boiled eggs, etc. But that’s not the point. Living in Alaska was harder than it needed to be for me because I just didn’t develop a taste for salmon. Scott, on the other hand, loves salmon. I mean, loves it. Salmon chowder, baked salmon, smoked salmon, salmon jerky, you get the picture. In fact, when we order sushi, I won’t eat any with salmon on it. Fish eggs? Sure. But if I see that raw pink fish, I pass. My salmon advice (from someone who does not eat salmon): Buy good salmon. The bags of Copper River Salmon are $34 at Costco. 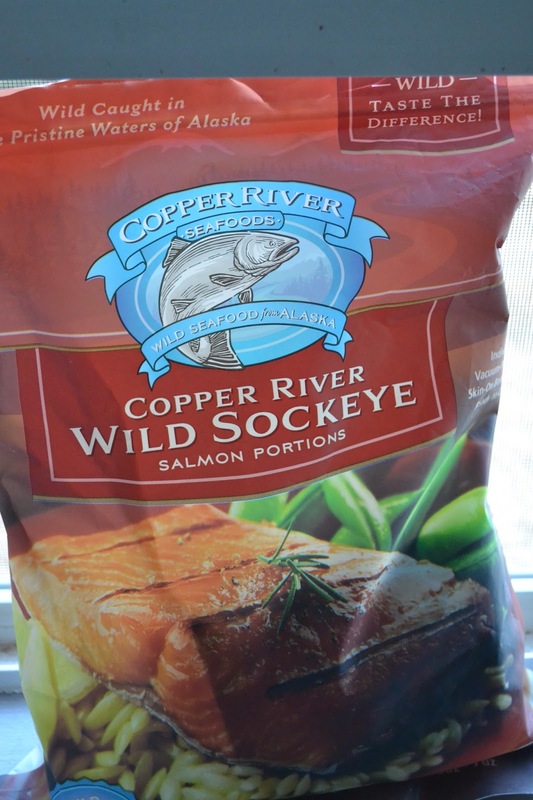 We used to get real live salmon out of the Copper River in Alaska and to buy the filets from Costco now is kind of like a punch in the stomach…however, it is what it is. Don’t buy Atlantic Salmon. It’s not the same thing. The good stuff will be more expensive, but buying the bags from Costco will save you in the long run. When Scott saw me typing this up, he asked why. He said it's not like I put anything special on it. Ahhh..Hmmm..Well. I do make it at least 3 days a week, so if I want to share this thing that I cook on the blog where I write about things I cook, then yeah, I'm going to share it. Thaw your salmon in warm water. Preheat the oven to 425 degrees. In a ceramic or glass dish, spread a little olive oil on the bottom and swirl the filet in it, coating both sides. Make sure it’s skin-side down when baking. Sprinkle with a little salt and pepper. Bake for 14-16 minutes. It’s done when it flakes easily with a fork. We eat a good bit of salmon. We used to eat it more often but have gotten out of the habit of it. I need to bring it back. But I can see how you might just not have the taste for it. My favorite salmon recipe would send you running for the hills though since it's made with a mayo sauce! haha! I am a huge salmon fan. MFD, not so much. I always buy from Sam's. That's basically my recipe, but I use capers and lemon sometimes too. Thanks for the tip on finding the good salmon. I like salmon, but it's expensive when it's fresh, and I've been nervous about the frozen bags. I do love salmon...always have, always will. Give it all to me. I like it plain with S&P and a little bit of lemon. No fancy salmons here. I haven't had salmon in a long time, I need to change that. Hmm I like salmon. I buy cheap salmon, though, because that's all we have here. Boo. I usually cook it similar to how you do, though with lemon. Ugh I don't like salmon either and Scott does. We found some at Sam's Club that comes in a large bag with individually wrapped packages. So he takes them to work. Which means that I don't have to cook them, thank goodness.